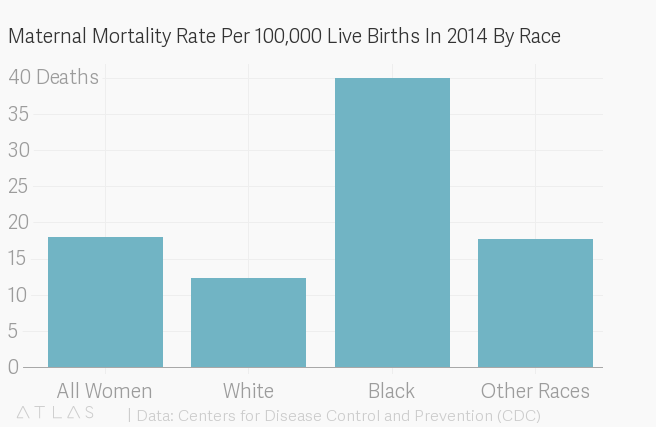 Black women are three and a half times more likely to die from pregnancy than white women. As we work to make health care a right to all we must address the outrageous racial inequalities in our current health care system. While estimates vary, Sanders is in the ballpark. For the period 2011-2014, the Centers for Disease Control and Prevention (CDC) reported a maternal mortality rate of 12.4 deaths per 100,000 live births for white women. Maternal mortality for black women was 3.2 times higher – 40 deaths per 100,000. Researchers who study maternal mortality report varying death rates, but they have nonetheless found a similar disparity between black and white women. “Non-Hispanic black women experience maternal deaths at three to four times that of non-Hispanic white women,” the American College of Obstetricians and Gynecologists says on its website. The CDC reported a mortality rate of 18 deaths per 100,000 live births for 2014, the latest year for which data is available. Pregnancy-related deaths have risen since the CDC began reporting data. In 1987, the maternal mortality rate was 7.2 deaths per 100,000. From 2011 to 2014, the most common causes of maternal mortality were cardiovascular diseases, non-cardiovascular diseases, infection or sepsis and hemorrhage, which combined, made up a total of 54.2 percent of all pregnancy-related deaths. While the odds of dying from pregnancy are relatively low, the risk of complications is higher for women who have chronic heart disease, hypertension and diabetes. When broken down by race, the maternal mortality rate for black women was 3.2 times higher than the rate for white women. Black women died at a rate of 40 deaths per 100,000 live births for the period 2011-2014, while 12.4 white women died per 100,000. Using the World Health Organization’s definition of a maternal death – which is limited to within 42 days of a pregnancy, as opposed to a year – researchers at the University of Maryland and Boston University arrived at different mortality rates. Non-Hispanic black women had a mortality rate of 56.3 deaths per 100,000 live births in 2013-2014, 2.8 times higher than the 20.3 mortality rate for non-Hispanic white women. A third analysis published in the journal Obstetrics & Gynecology found that from 2011 to 2013, the mortality ratio was 3.4 times higher for non-Hispanic black women. Experts offer a variety of reasons as to why this gap might exist, including implicit bias and racial disparities in treatment, access to care and the prevalence of chronic health conditions in socioeconomically disadvantaged populations. The CDC says more recent data isn’t available due to differences in how states report maternal deaths. “We’re in the process of bringing all the states towards a more uniformed way to fill out this information on the death certificate, which in turn will give us better national data,” a spokesperson told The Daily Caller. Somewhere around 1,000 women in the U.S. die each year as a result of pregnancy complications.